Go try the Setup Editor! 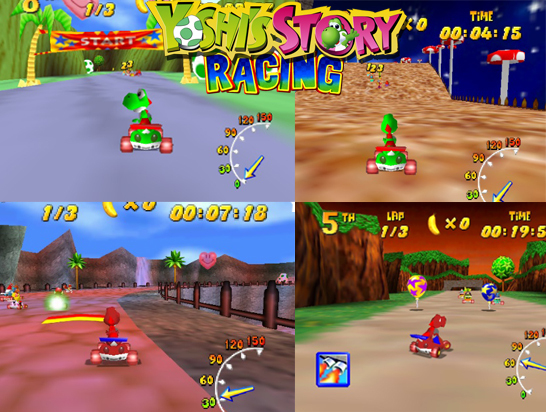 *Mod that features Yoshi as a playable racer. Green Yoshi replaces Timber and Red Yoshi replaces TT. Red version has TT stats for more speed and is a smaller scale. It also has 4 brand new levels in a Yoshi universe theme. *Car/hover/plane vehicles are supported for Yoshi. With an update I'd like to add levels to correspond with them. More levels to come to go with Hover and plane also. Soon. *There is also a "Yoshi Only" version which will not have any new levels here: Coming very soon. Yoshi Falls, Replaces Ancient Lake: Brand new Level using SSB Yoshi textures. Tall Tall Yoshi, Replaces Hot Top Volcano Uses Tall Tall Mountain Textures also uses the SM64 mushrooms as prop design. Yoshi Donut Replaces Everfrost Peak: A retexture of the Big Donut level originally from SubDrag its a snowy donut. SubDrag for creating the editor and original work. Mosky2000 for amazing music tips and creating the music for Yoshi Canyon! Rareware and its individuals for making these amazing games. Installation : Apply a xdelta patch to the xdelta file and run the rom on your choice of software or N64 console.